No words can describe the value of this dog. NAVAR commenced his short Show Career in the puppy classes, winning OP. 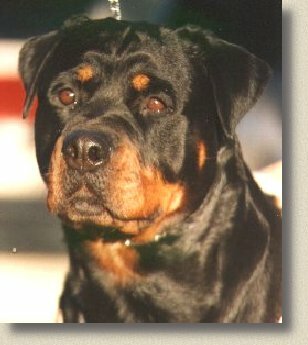 MINOR IN SHOW at the 1992 NSW Rottweiler Club CHAMPIONSHIP SHOW under HERR DIETER HOFFMAN (Germany). Large. Well built. Attentive. Strong head. Medium sized ears. Dark Brown eyes. Scissor bite. Dark flecked lips. Well muscled neck. Forequarters correct. Good topline. Well angulated. Free movement. Strong coat. Very good markings, slightly rusty on paws. He then followed this win with PUPPY OF BREED and then PUPPY IN GROUP at the 1992 Brisbane Royal National Show under MR M. FARKASHASI (Hungary) and MINOR PUPPY IN SHOW at the Junior Kennel Club Show under MR H. FIELD. Unfortunately NAVAR's show career was soon halted due to a badly broken leg and subsequent osteomyelitis through which he almost lost his leg. It was said that he would never again be sound enough to show, but in his true determination and spirit he proved the orthopaedic specialists wrong and after a nearly two year absence from the ring, he returned and achieved his conformation title in three months. He collected 16 CC's (most of these with BEST OF BREED), 12 Res. CC's and many IN GROUP and IN SHOW awards along the way. Then came his influence as a stud dog. Producing very sound progeny to a variety of lines. His name is found behind many of our current young 'stars'. But NAVARS' priceless value was as a loyal companion. He never gave up, even when the cards were stacked against him.